Believe it or not, it’s one year to the day since I published my first CBBH Photo Challenge. How time flies when you are taking photographs! Anyway, for this month’s challenge, if I were to I say “Ancient and Modern” – what would you think of? Would it be hymns, languages, history, art, the Olympics or maybe architecture? Within one photograph, I want you to show me your interpretation of Ancient and Modern. Don’t forget that the CBBH Photo Challenge is a little different from some other challenges, in two ways. First, it’s only once a month – giving you lots of time to consider your entry before the end of the calendar month. Second, and most important, this is a BLOG HOP (after all, it is the CBBH – Conejo Blanco Blog Hop, meaning white rabbit in Spanish), so DON’T FORGET that in your post you need to add links to two blogs that you have visited and commented on, during the past month. That way, when we visit each other, we can HOP OVER to your links, connect with others and share a little blog love around! I’ve blogged before about El Paseo de las Tradiciones in the white village of Cómpeta, but it’s a perfect example of the beautiful modern ceramic murals celebrating the lives of generations of the working people of the village, annexed to the 500 year old Church of Our Lady of the Assumption (La Iglesia de Nuestra Señora de la Asunción). Here you can see the 15th century Cathedral in Seville, with its famous Giralda Bell Tower, as viewed from the very modern Metropol Parasol. More popularly known as Las Setas (the mushrooms), this huge wooden structure was built between 2005 and 2011 in the heart of the city. It seems people either love it, or hate it. I LOVE it! Back in May, I visited the city of Granada and, whilst we were having lunch in one of the wisteria-covered restaurants in Paseo de los Tristes, in the shadow of the Alhambra, I grabbed my camera when I saw a jet appear above the turrets of the ancient monument. It was this shot that first gave me the idea of this month’s theme. 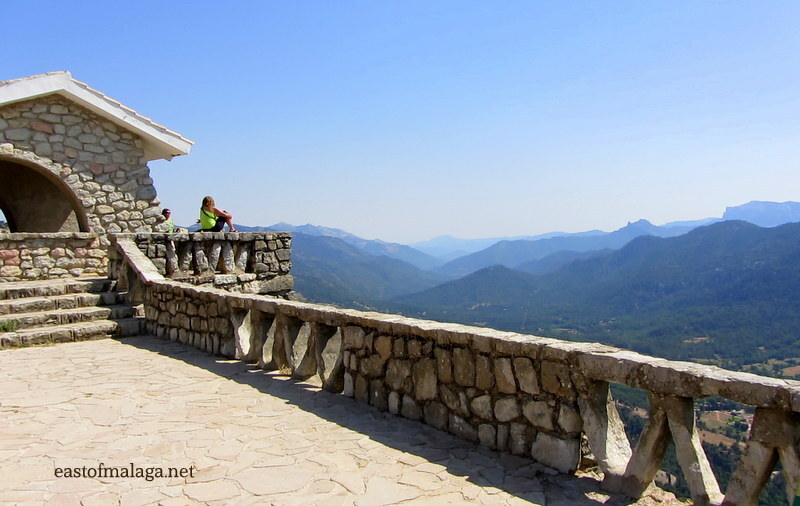 And finally, this modern stone architectural structure (known in Spain as a mirador – or look-out point) is sited to take advantage of a the scenic view over the UNESCO World Heritage Cazorla National Park in Jaén province. The Parque Natural de las Sierras de Cazorla, Segura and La Villas, to give its complete name, is Spain’s largest national park and the second largest in Europe. It’s marvellous to just gaze out and wonder at who has looked across these same mountains in days gone by. ** Spain for pleasure follows the adventures, misadventures and quiet musings of an earnest (British) expat living “la vida loca” in Granada. I was amazed (and envious) to read Josh’s tale of when he played a part in the best EVER water-fight in Lanjaron, but one of my favourite posts is his “Piste 2 Playa Project” when he took the ultimate day trip from Granada to ski in the morning in the Sierra Nevada mountains and sunbathe on a Mediterranean beach in the afternoon. 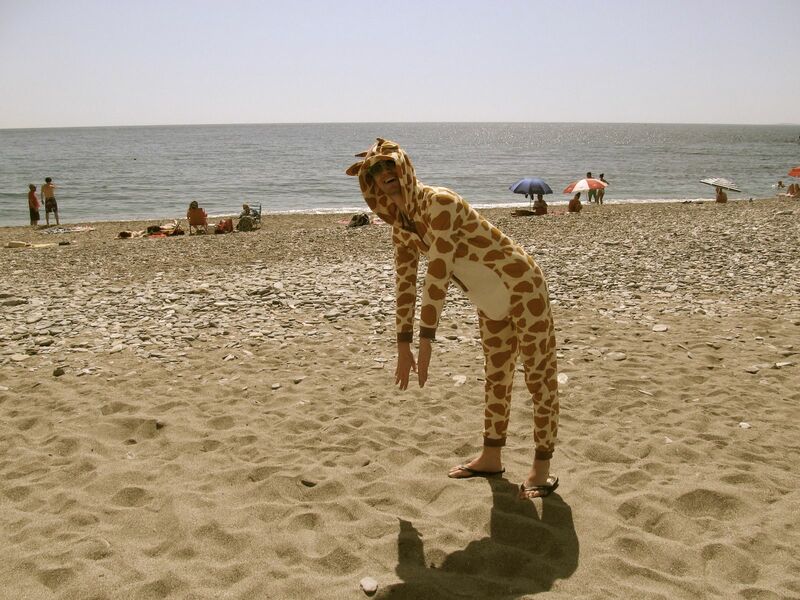 Quite why he had to do it dressed in a giraffe onesie (especially on a nudist beach) is beyond me – but that’s Josh for you!! When he’s not having such interesting adventures, Josh earns his keep teaching English as a foreign language, so if this is something you might be interested in, head over and take a look at his blog. You’re sure to find something of interest – I always do! So that´s the CBBH Photo Challenge for August, folks! Remember, all you have to do is post your entry by the end of the month, tag your entry ‘CBBH Photo Challenge’, link back to this blog and, most importantly, don´t forget to add links to any two blogs that you´ve commented on during the past month, so that we can all HOP OVER and have a look. Make sure you FOLLOW THIS BLOG so you don´t miss next month´s exciting challenge! For more information on how the CBBH Photo Challenge works click here. I hope everyone taking part enjoys the exposure the CBBH Photo Challenge offers to featured blogs and, who knows, you may end up finding a new favourite! I´m looking forward to seeing your interpretations. This entry was tagged Andalucía, Cazorla, Cómpeta, CBBH, CBBH Photo Challenge, East of Malaga, Europe, Granada, photography, Seville, Spain, travel. Bookmark the permalink. Two great links, too – well done! Pingback: Let’s FOCUS on being a little kinder to each other | East of Málaga .... and more! I totally agree with you about the pyramid-shaped entrance to the Louvre. It always takes my breath away – and works so beautifully, don’t you think? 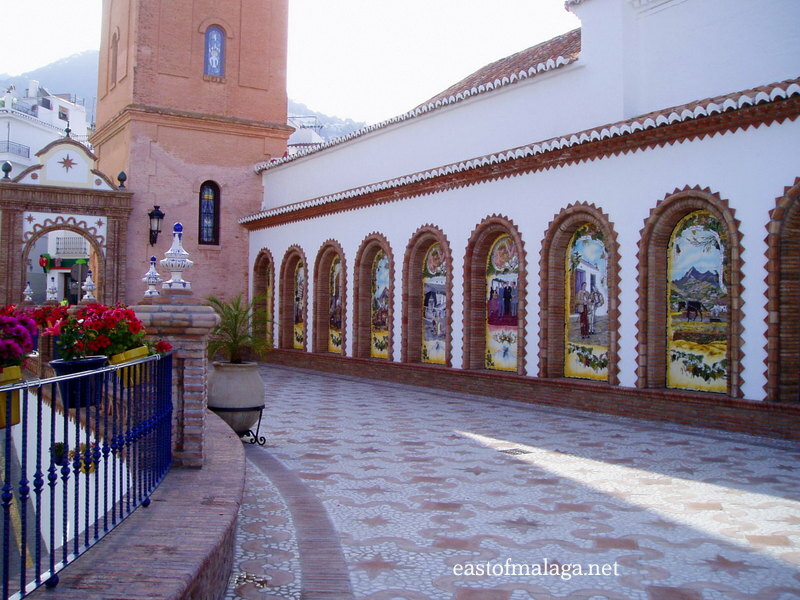 Pingback: Cost of Living in Spain: August 2013 | East of Málaga .... and more! Great photos, Meg. You’ve captured this theme beautifully! Thanks for sharing them with us, along with links to two great blogs. Hope you manage to get to Granada next year – let me know if you do, wont you? I’ve got myself organised this week and here’s my entry: http://travelwithintent.com/2013/08/10/ancient-and-modern-moscow/. I usually think about the challenge for a few weeks and then miss the month completely! Oh, and I loved your photos and your recommended blogs. I am following both of them now. Ah, but you made it in good time, this month Debbie. aha! I went to the page for the CBBH challenge and did not see it there….and then thought maybe it was a weekly one that I missed. I just posted my entry for what I thought was an old challenge. my new friend catbird just clued me in. so, here is my entry. I will have to update it to include two blogs later. oy yoy yoy!! You didn’t miss it – your timing is perfect! Love your photos – my favourite is the first one. I love the way the new building is peering up from behind the old one – saying “Me, me – I’m here, too!”. Glad that Cathy was able to help you out. lots of beautiful flowers and poems and other things. Enjoy!! Living on the west coast of Canada, it’s hard to find examples of ancient. Though I haven’t been, I’d love to see the totems of Haida Gwaii. 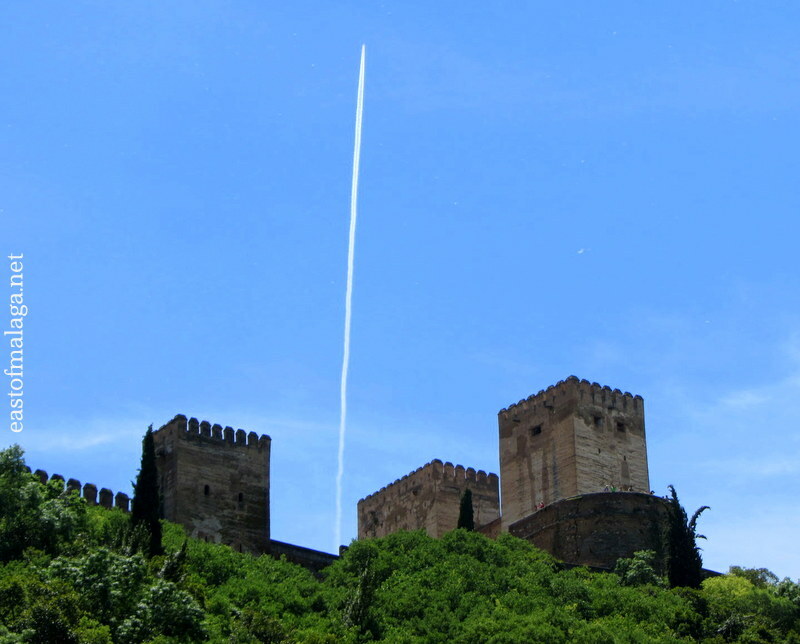 Amazing that jet over the Alhambra! So neat. The shot with the jet is amazing, but I really like the Cathedral in Seville shot. Beautiful shots – all of them. Thanks and you’re welcome, Josh. Hey, it’s not only the first anniversary of the CBBH Photo Challenge – this is also my 200th blog post, I’ve just had the 6,000th comment posted – AND I’m about to hit 2,000 followers! WOOHOO!! Congrats on the 1 year anniversary. It seems like only yesterday. 🙂 Wonderful photos for your theme. OOHHH you’re welcome – the second will be on it’s way very soon! Thanks for your congratulations 🙂 Much appreciated. This is an awesome theme, Marianne. I’m in awe of the jet above the Alhambra shot! Fabulous view of the park! 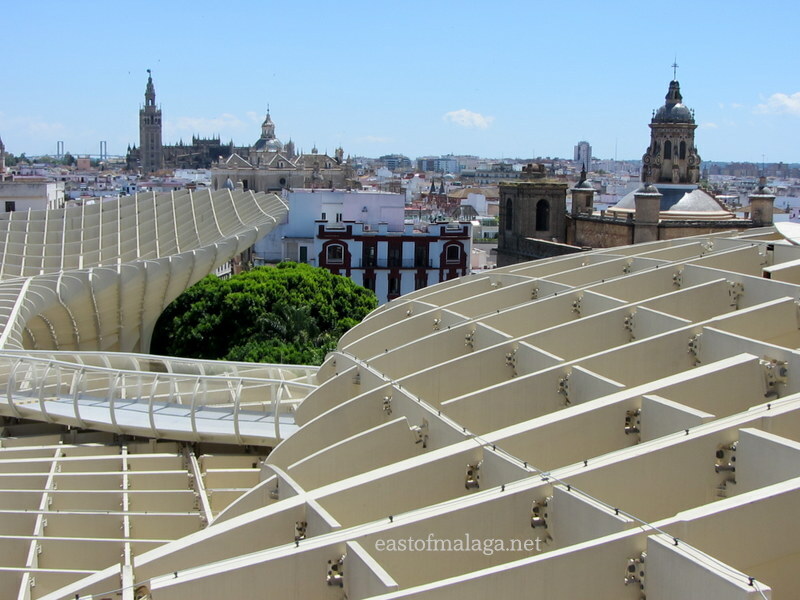 The metropol parasol is an amazing piece of architecture! People hate it? How is that even possible!! And that jet is going straight up! Holy cow, great capture! Congrats on reaching the one year mark with this challenge. I’m not surprised it’s done well, though…it’s a fabulous and different idea. Yes, I was so lucky with the jet over the Alhambra shot! It looks very sunny there! Beautiful pictures. Your posts always increase my urge to visit la Costa del Sol, and I hope it will happen for me some time in the future. This time I want to show you and your crowd some of Italian architectural gems ;). Basilica Palladiana overlooking the Piazza dei Signori. Excellent idea this month, Marianne. I’ll have to go looking. I adore the look of the Parasol in Seville. Must go and seek it out someday soon. The views are fantastic. Yes, I always say Conejo Blanco – funny that!